Goldman Sachs still enjoys a reputation as one of the world's most commercially astute investment banks. However not even the golden child of the banking sector was immune to the savage downturn in the market during 2008, which crippled Goldman's stock price and forced it to abandon its legal status as a securities house in order to maintain the confidence of its own shareholders. Previously, unlike most of its peers, the company had resisted the temptation to diversify into a broader selection of financial services during the 1990s and early 2000s. Instead it focused even more tightly on what it does best, moving more quickly than any of its peers to take advantage of new trends within the industry, with great skill and extraordinarily lucrative results. Until 2008, that is, when the firm reported its first ever quarterly losses. By early 2009, Goldman was once again firing on all cylinders, allowing it to report another set of record results for the year. Since then, though, performance has been somewhat less inspiring as the firm took action to shift its focus away from the riskier activities in which it had previously excelled. Adbrands Daily Update 25th Feb 2019: Apple will team up with Goldman Sachs to launch a new credit card and consumer finance service, uniting two of the most prestigious names in US tech and banking. It represents a significant ramp-up in Goldman's tentative moves into traditional retail banking, initiated with the launch of consumer bank Marcus in 2016. This will be its first credit card offering. It is expected to launch for Apple employees within the next month or two, using the Mastercard network, and then will roll out to new sign-ups later this year if all goes smoothly. Currently Apple earns only a small commission when iPhone users make purchases through Apple Pay using third-party cards. It would get a much bigger cut from its own card. Adbrands Weekly Update 19th Jul 2018: US banks kicked off the reporting season with generally strong results. JP Morgan Chase led the charge as usual, with revenues up 6% to $27.7bn, while net income jumped 18% to $8.3bn, helped by higher interest rates and loan growth (and also of course a lower tax charge). "We see good economic growth, particularly in the US, where consumer and business sentiment is high," said CEO Jamie Dimon. Corporate and investment banking were particularly strong, offsetting declines in mortgages and credit cards. Bank of America took a slight hit on revenues, down very slightly to $22.6bn year-on-year because of a one-off gain in the prior period. Stripping out that exceptional item, comparable revenues were up 3% and net profits soared by 33% to $6.8bn. Citi's results were a little more muted, though revenues rose 2% to $18.5bn. In Citi's case, consumer banking generally fared better than investment banking, though the group's treasury and custody services were the strongest performer overall. Net profit jumped 15% to $4.5bn on the lower tax charge. Wells Fargo is still struggling under the cloud of its customer mistreatment scandals, with revenues down 3% to $21.6bn and an 11% fall in net profit to $5.2bn, despite the lower tax rate. The company said rising interest rates are putting homebuyers off new mortgages. There was much better news from Goldman Sachs, where profits soared 40% to $2.6bn on revenues up 19% to $9.4bn. Goldman also confirmed that Lloyds Blankfein will step down as CEO later this year, and will be succeeded by current president David Solomon. Morgan Stanley also reported a big jump of 39% in profits to $2.4bn - its second highest figure ever after 1Q 2018 - on revenues up 12% to $10.6bn. Adbrands Weekly Update 17th May 2018: Goldman Sachs is to expand its newly established consumer banking business by teaming up with Apple for the launch of an Apple Pay credit card, expected to launch early next year. The new partnership will replace Apple's existing arrangement with Barclays, and could also be extended to include loan finance for new Apple products. Apple would receive a cut of all expenditure and might also take a "bounty" on every newly signed-up credit card customer. More than 200m customers worldwide already have Apple Pay installed on their iPhones. Traditionally a specialist in investment banking, Goldman's first foray into the traditional consumer market came with the introduction of online savings service Marcus in 2016. Adbrands Weekly Update 18th Apr 2018: American banks enjoyed big profit gains from US tax reforms, as well as generally upbeat business sentiment. Net income at JPMorgan Chase jumped by 35% to an all-time record for the bank of $8.7bn, while Bank of America grew 30% to $6.9bn. However both were beaten in percentage terms by Morgan Stanley whose net earnings jumped by 38% to $2.7bn. Goldman Sachs was the next biggest profit jumper, up 26% to $2.8bn, while Citi was up 13% to $4.6bn. Wells Fargo gained 5% to $5.9bn, but said it might be required to restate those figures at a later date to accommodate a forthcoming $1bn regulatory settlement over mis-sold car insurance and mortgage fees. The lower tax rate alone generated a combined total of $2.9bn in extra profit from the six companies. Yet despite those big gains, investors were generally unimpressed by the lack of any significant growth in lending to businesses and consumers. That was one of the key underlying motivations for Republicans' tax reforms: to encourage borrowing and growth in the wider economy. So far, there's no sign of that, as JPMC finance chief Marianne Lake admitted: "I think we have to recognize that tax reform is in its early stages." As far as revenues were concerned, JPMC remained the clear leader among US banks with 12% growth to $27.9bn, but reigning #2 Wells Fargo slipped back to $21.9bn - it was the only bank to report a year on year decline. That allowed BofA to reclaim second place with $23.1bn. Citi had $18.9bn. Morgan Stanley topped Goldman again with $11.1bn to $10.0bn respectively. Adbrands Weekly Update 18th Jan 2018: Most US companies will take an exceptional hit in their 4Q results from President Trump's tax reform bill, not least the big banks who kicked off the reporting season this week. The cut in the US corporate tax rate will significantly benefit all companies in the future but it creates a short-term problem for businesses that accumulated big losses during the 2008 financial crisis which they had intended to set off for tax purposes against future profits. A lower tax rate will make those deferred credits harder to use, so they now mostly have to be written off. That's a bigger issue for some companies than for others. Goldman Sachs took a $4.4bn charge, but perhaps more worrying was a sharp decline - a startling 50% plunge for the final quarter - in what was once its biggest income stream of fixed income trading. That was offset by gains elsewhere, with the result that full year revenues were up 5% to $32.1bn. Net earnings almost halved after the tax charge to $3.7bn. A resulting slump in Goldman's share price means that it is less valuable by market cap than rival investments house Morgan Stanley, which reports later today. Free for all users | see full profile for current activities: The firm was first established in 1869 by Marcus Goldman to trade in commercial paper in New York's diamond-broking district. 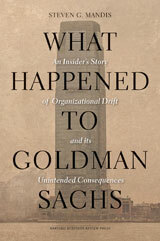 In the 1880s, Goldman recruited his son-in-law Sam Sachs as a partner, creating Goldman Sachs & Co. The business joined the New York Stock Exchange in 1896 and entered the field of investment banking in 1906 when it co-managed a public offering for United Cigars Manufacturers. It was a pioneer in the developing field of IPOs, responsible for underwriting offerings for companies including Sears Roebuck and Merck. Although several members of the Goldman and Sachs families led the firm over the following years, its most influential figure was Sidney Weinberg, widely regarded as the country's most skilful businessman in his heyday, earning the nickname "Mr Wall Street". In fact he first entered the firm in 1907 as assistant janitor, but gradually clawed his way up the corporate ladder, becoming a partner in 1927, and then senior partner from 1930 until 1969. Weinberg played a key role in re-establishing the firm's reputation after it was tarnished by the collapse of a closed end mutual fund scheme in the Great Depression, which made and then lost huge sums for its investors. In particular he developed a close relationship with leading tycoons, which enabled the firm to broker a string of giant deals after World War II, including the mammoth IPO of Ford in 1956. In the 1980s, with corporate America under attack from leveraged buyout raids funded by other investment banks, Goldman was one of the few major banks to side with corporations against the raiders, confirming its reputation as an ally of big business. Goldman Sachs' partners repeatedly considered a public offering of their own, drawing up and then abandoning plans on three occasions before finally biting the bullet in 1999, when a minority stake was sold to the public for almost $4bn.